WORKING GIRL: Ricketts recently brought her MGFG tour to Mandeville's Belair High. It seems fitting that for a young woman who is all about making strides and that get up, stand up vibe, reigning festival queen Chereese Ricketts has embarked on a project dubbed “Move Good, Feel Good”, a nationwide initiative she’s using to challenge Jamaicans to become more vocal and active in dealing with the stigma of mental health and other break-the-silence social issues. 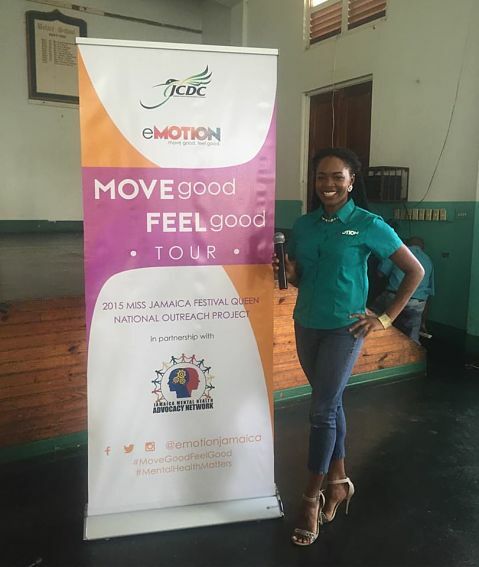 To spread the message far and wide, the 26-year-old achiever and her team have planned a tour, with stops scheduled for her native Manchester (Belair High, recently) and St. James (within the next two weeks) before culminating here in Kingston in May/June. 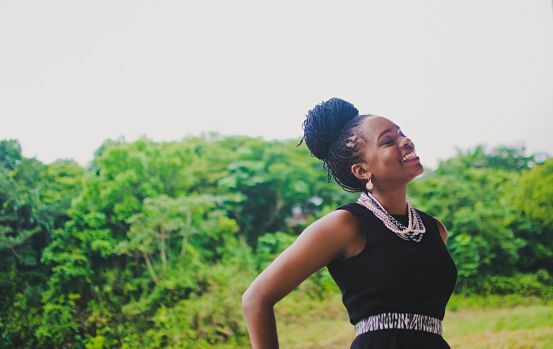 TALLAWAH rang up the brainy beauty to talk about her own triumph over anxiety and depression, being a role model for young Jamaicans and how she musters the energy to live her best life. TALLAWAH: This nationwide initiative “Move Good, Feel Good” has such an empowering ring to it. Where do you get your ideas? Chereese Ricketts: This one in particular is from my own personal experiences. I’ve struggled with mental health issues growing up. Anxiety and depression were things I had to deal with in school, and the solution I found was to move my body, dance, do something with motion. People aren’t bold when it comes to talking about the issues that they have, so I wanted to start the conversation about mental health in a serious way and let people know that they can seek professional help and go on to live productive lives. TALLAWAH: What do you hope will be the initiative’s long-term benefit to Jamaicans? C.S. : I want to keep it going for years to come. E-Motion is the company I started after I won the festival queen title, and with my team we’ve launched this initiative, which we are taking islandwide. Winning [Miss Jamaica] Festival Queen was an opportunity to jump-start this project during my reign. But it’s my life-long passion, so I definitely want it to continue. I want Jamaicans to be more open about their state of mind and develop solutions to deal with mental health issues because we cannot move forward as a nation unless we have people who are stable and healthy. TALLAWAH: What was your biggest fear about embarking on such a project? C.S. : The size of it. It’s triggered my anxiety (Laughs). My biggest fear is that I can’t do it because it’s so big. We brought the tour to Belair High School recently, and I was expecting about 100 people, but only 40 turned up. But I’m still motivated. No matter how many people I touch through this project, it’s better than none. I’m still making an impact. It’s a lot of work, but I’m passionate about it. TALLAWAH: They say success has many fathers, but failure is an orphan. How do you usually cope when a project doesn’t pan out? C.S. : I try to manage my expectations. This project is a team effort, and working with my team I know what we are capable of, so I will put forward the energy. I get great support from the team members. Usually if I can’t do something, I don’t worry about it. I just learn to accept. And that’s how I want this project to unfold. TALLAWAH: It’s been almost a year since you were crowned festival queen. What have you been learning about yourself on this journey? C.S. : I’ve learned that I need to be more open to receiving support from people. And also there are a lot of young people who look up to me as a role model and as a new standard of beauty. I never thought of myself as beautiful, but I’ve had girls coming up to me to tell me how beautiful I am. For me, true beauty comes from the inside. I do have my limitations; I know I’m not perfect, but it’s so important to keep going. TALLAWAH: You seem to thrive on a busy schedule. How do you maintain a balanced life? C.S. : The way to balance it all is to cut away the excess. As a hardworking young woman I have a lot on my plate, so I’m trying to take stock of what I have to do. I have a lot of commitments and it takes a lot of energy. So I’ve learned to say no, and what needs focusing on that’s what gets my attention. I have learned to let go of what I need to let go of.